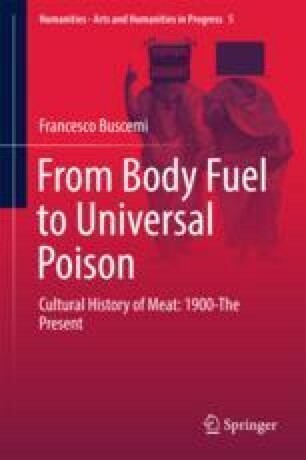 This chapter introduces the reader to the analysis of the cultural history of meat in the years from 1900 to 1918. In the first section, I summarize what meat perception was at the end of the nineteenth century, in order to accompany the reader through the rest of the chapter. After this, the analysis focuses on Upton Sinclair’s novel The Jungle and on some works by Joseph Conrad, which are really helpful to understand how meat and meat perception changed in the first part of the twentieth century. Later, the center of the analysis involves slaughterhouses, shifting from private enterprises to public service, and butchers, who detached their job from animal killing but not from animal death. The following section regards vegetarianism in those years. Finally, I investigate the many ways WWI changed the human approach to meat. The short story is about the difficulty for children to distinguish between animals to love and animals to eat. Antiquite et brocante de France. 2017. Ancien étui de boucher en bois compartimenté 1900. http://www.antiquite-brocante-de-france.com/index.php/shop/cuisine/ancien-etui-de-boucher-en-bois-compartimente-1900.html Accessed 24 February 2017. Familles de Quintenas. 2017. Abattage devant la boucherie Léorat. http://familles-de-quintenas.com/plans-et-familles/pillats-ouest/. Accessed 24 February 2014. Hiltl (2017) Locations. Accessed 6 March 2017. http://www.hiltl.ch/en/. Histoire en questions. 2017. L’apprenti boucher en 1900. http://www.histoire-en-questions.fr/metiers/boucher.html. Accessed 24 February 2017. Hix, Lisa. 2012. Baby’s first butcher shop. Collectors weekly. http://www.collectorsweekly.com/articles/babys-first-butcher-shop-circa-1900/ Accessed 24 February 2017. Macelleria Vitozzi Vincenzo. 2017. Com’era una volta. http://www.macelleriavittozzivincenzo.com/chi-siamo.html. Accessed 24 February 2017. The New York Times. 1865. The slaughter-houses of New York. 18 December. Checked 23 February 2017. http://www.nytimes.com/1865/12/18/news/city-nuisances-the-slaughter-houses-of-new-york.html?pagewanted=all. Townsend, Peter. 2017. Victorian butcher’s shops c. 1900. Flickr. https://www.flickr.com/photos/brizzlebornandbred/5441486228. Accessed 24 February 2017.